Underneath the paving where traffic now crawls and honks along Port Sa‘id Street in Cairo, until 120 years ago a canal wound through the city, remnant of the ancient waterway that once connected the Nile to the Red Sea. It was filled with water annually during the Nile flood, and thus for eight months of each year, it fed the city’s lakes. In the 17th and 18th centuries, when Egypt was under Ottoman rule, the banks of the canal and lakes became fashionable places for the affluent to build residences. Mosques and public buildings, too, graced the seasonal watersides. Across the canal from the famous mosque dedicated to the Prophet Muhammad’s granddaughter Sayida Zeinab, a dual-purpose building was erected just over 250 years ago to house religious charities: a sabil (sa-beel) from which free drinking water was distributed, and a kuttab, an elementary school. The building is unusual in more than one way. It is one of only two among Cairo’s more than 300 historic sabil-kuttabs (of which about 70 still survive) that was founded by an Ottoman sultan. Its architecture mixes styles that developed in Istanbul with the local tradition indigenous to Cairo. Most extraordinarily of all, its interior is decorated with some 2,500 blue-and-white wall tiles that depict flowers, landscapes and scenes of rural life in the Netherlands: Why did a ruler residing above the waters of the Golden Horn decide to use tiles painted in Amsterdam to adorn his charity along a canal in Cairo? Marble veneer carved with arabesque and lintels of stone in alternating colors frame the three large, grilled windows of the sabil, or public fountain, of Mustafa III. His tugra, or official calligraphic seal, is set above each window. Of the more than 300 sabil-kuttabs that once existed in Cairo, today about 70 remain. In 2008 and 2009, during our involvement in the Dutch-led conservation of the building, we had the opportunity to listen to how this sabil-kuttab answered questions about how and why it came into being because, indeed, historic buildings can speak in many ways, if we wish to listen. What exactly was this structure, at once typical and unique? Sabil-kuttabs are Cairo’s hallmark contribution to Islamic architecture. Sabils offering free drinking water can be found throughout historic Muslim lands, but in Cairo, where potable water had to be bought from watercarriers because wells were brackish, they were a particularly welcome charity. Similarly, kuttabs endowed as charities to care for orphans are numerous, but it was in Cairo that patrons conjoined the kuttab and the sabil into a single building. Funding one was a noble act of benevolence, but also a way to commemorate deceased family members, or to advertise one’s wealth and status. Signaling his sultan’s interest in the science of the late 18th century, artist Konstantin Kapidağli set a globe, books and a telescope below his portrait of Ottoman Sultan Mustafa III. of Egypt that had been a regional power for more than 250 years was terminated. The country became another province within the Ottoman empire, ruled by a governor appointed from Istanbul for short-term tenure. Although commissions ceased for magnificent buildings like those erectedby the Mamluk sultans, Cairo nevertheless continued its own Mamluk-influenced building tradition. Indeed, many of the sabil-kuttabs are good examples of how Mamluk-style architecture continued with very little change. In Ottoman-ruled 16th- and 17th-century Cairo, they were practically indistinguishable from their Mamluk-period predecessors. Not only the overall arrangement and decorative motifs remained unchanged, but also building techniques were the same, down to the standard size of masonry blocks of the local limestone. By the middle of the 18th century, however, strong Turkish inﬂuence started to shape buildings erected in the Egyptian capital, such as the 1744 sabil-kuttab of Abd al-Rahman Katkhuda, which remains a famous landmark in its prominent location where the medieval city’s main street forks. Such buildings displayed a style that blended local tradition with ideas borrowed from Istanbul, and the sabil-kuttab of Sultan Mustafa III is a product of this time. Its façade is curved, like in many contemporary sabils of the imperial capital, where “Ottoman baroque” was the order of the day. Also following Istanbul, and unlike Mamluk-style buildings where decoration was carved in the structural limestone masonry, the façade is covered in marble and decorated with typically Ottoman motifs, including the tuğra, the calligraphic emblem of the Sultan’s name. 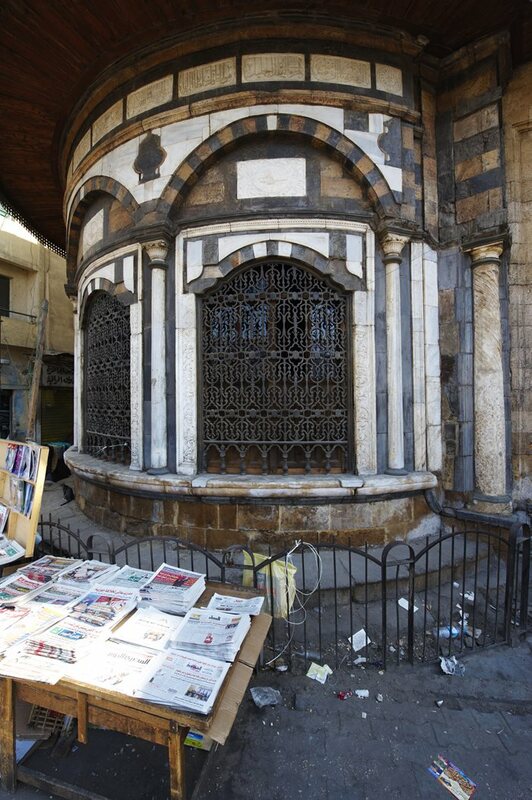 To this day, the approximately 70 sabil-kuttabs still standing define much of the character of historic Cairo. They began as a constant feature in the mosque-madrasa complexes built in the city by Mamluk rulers and princes from the 14th century on, maintained by money from awqaf, or religious endowments. A sabil room was always located in a corner of the building for accessibility and ventilation. Through openings in grilles set in huge windows, people received from attendants mugs of water drawn from an underground cistern filled annually during the Nile flood. Above the sabil room, children learned to read and write in a spacious loggia of arches supported on marble columns and shaded by large, decorative awnings. Later sabil-kuttabs were built as stand-alone structures. By Ottoman times they had become a favorite way for wealthy patrons—including women—to publicly ex-press pious benevolence. They fell out of use in the 19th century with the arrival of public schools and residential piped water. Nowadays, although nobody erects sabil-kuttabs anymore, on the streets of Cairo one can still obtain a free drink of fresh water from any of the numerous water-coolers provided to the public as charity. However, it is still functionally a sabil-kuttab, a type of building unique to Cairo. In the interior, geometric mosaics of multicolor marble that could just as well decorate a Mamluk-period building appear alongside Ottoman-style painted ceilings and friezes. But the most surprising feature of thesabil room are the arrays of blue-and-white, painted, square Dutch tiles that cover the upper parts of the walls. Some are decorated with hyacinths or roses, and others show landscape scenes that offer cameos of Dutch daily life. Cities, villages, bell towers, gates, castles, bridges, houses and windmills sit in landscapes filled with trees, lakes, ponds and canals, fields and meadows; distantships sail the sea and birds ﬂy among the clouds while people go about their business. Tiny figures of men and women work in the fields, ride on horses, hunt with dogs, ﬁsh, row boats, travel in carts and coaches, milk or herd their farm animals, exchange greetings, engage in conversations and even subtly flirt; they eat and drink, or just rest in the shade. This display of figurative painting is particularly surprising in a building erected to house an Islamic religious charity; however, people who received water from the sabil would not normally enter the room. They would have been outside, looking in only through bronze window grilles as they received their brass mugs full of water, from which they would drink and hand the mug back inside. They would not see the details of the paintings, but likely they could make out a pattern of blue and white panels. Because the ﬂoral tiles look predominantly white, and the landscape ones are heavily blue, Sultan Mustafa’s builders used them to form decorative bands and panels: They were apparently more interested in the overall color scheme than in the individual pictures. The windows of the kuttab, or school, on the floor above the sabil, were partially shaded. The Dutch tiles inside the sabil covered the upper walls and arches. Over time, some tiles fell off, and the remainder have been restored. To offer water to passersby, attendants dipped mugs into the basins below each window and handed them through the window grilles. The sabil’s water source was its cistern, which was filled annually when the Nile flood flowed into the canal that formerly ran alongside the building. How did 2,500 painted tiles produced in Amsterdam end up Cairo? The Dutch scholar Hans Theunissen pieced together evidence that he published in 2006. 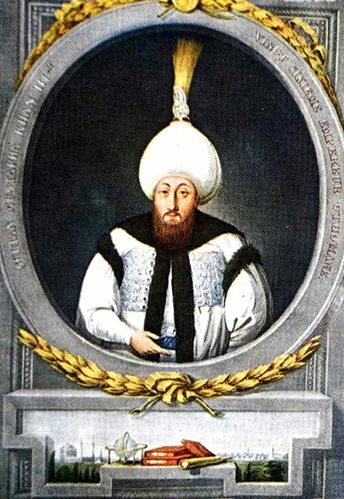 In October 1756, a year before the accession of Mustafa III to the throne and three years before the completion of his sabil-kuttab in Cairo, his predecessor, Sultan Osman III, ordered Ottoman authorities in Belgrade to send to Istanbul 12 crates of ceramic tiles that had been bought in Vienna for decoration of imperial buildings. The intermediary in this purchase was an English merchant in Istanbul. The tiles were almost certainly Dutch, because Vienna was a center for trade in Dutch tiles both for local use and onward to Poland and Russia. The Netherlands was the uncontested leader in production of wall tiles at the time. 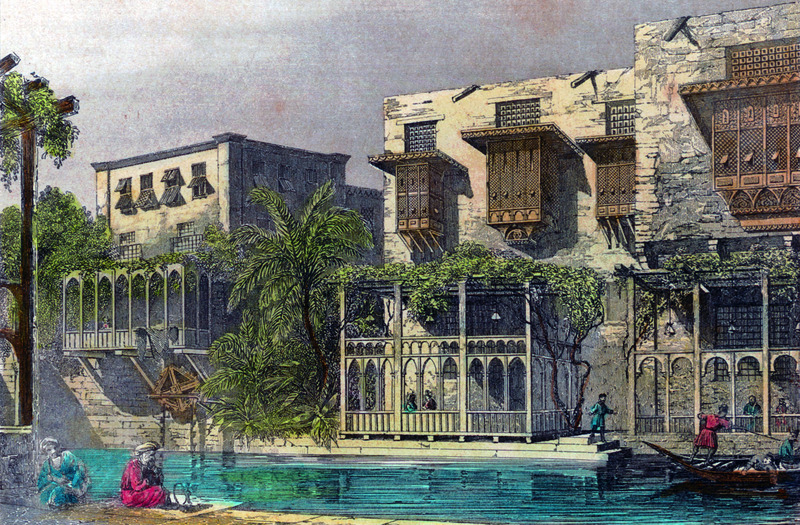 Not far from the site of the sabil-kuttab of Mustafa III, a lithograph published in 1821 in Egypte Moderne by A.F. Lemaitre shows a few of the villas along the Khalig al-Misri canal. This detail from Sebastian Münster’s 17th-century map of Cairo is based on an original drawn in 1549, 210 years before the sabil-kuttab of Mustafa III was built. Nevertheless, the landmark’s future location can be determined clearly. Theunissen asserted that these were the tiles that eventually ended up in Cairo. During Osman III’s reign, Dutch tiles identical with the handful of rose-flower ones that can be seen on the walls in the sabil of Mustafa III were used in the Topkapı palace in Istanbul. This would account for how few tiles showing this motif reached Cairo—because many had been removed from the lot and used in Istanbul. 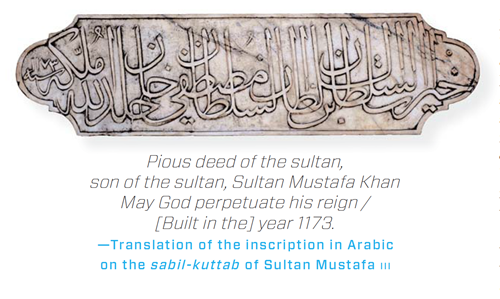 Sultan Osman III was near the end of both his reign and his life, and it is likely that Mustafa III inherited from his predecessor the set of “Delft blue” wall tiles. This was a prestigious commodity. By the 18th century, İznik had lost its supremacy as the leading production center to Kütahya, and both output and quality had declined in the western Anatolian pottery workshops. While walls flowering with magnificent İznik tiles were the pride of Turkish mosques and palaces in the 17th century, by Mustafa III’s time they are absent even from imperial foundations. The “Delft blue” was the best-quality product available, and the Sultan had good reasons to wish to impress his subjects in Cairo. In Ottoman Egypt, resurgent power of the Mamluks advanced steadily and at the expense of the authority of the sultan’s governor. Though no longer ofﬁcially ruling the realm, Mamluks held onto key positions in the administration, and their private troops allied with different sections of the Ottoman garrison: By the 18th century, the only way for the governor to exercise power was to align with one Mamluk faction against another. Two types of square tiles were used among the 2,500 in the sabil-kuttab: Vividly varied, often complex scenes of Dutch life set in a circle with a floral motif in each corner, and tiles with a single hyacinth motif that varied only slightly from hand-painted tile to tile. Their placement, lower, created decorative bands and panels. Highly fashionable in the 17th century, this hand-painted “Delft blue” tile from the sabil-kuttab shows various Dutch scenes. Two types of square tiles were used among the 2,500 in the sabil-kuttab: Vividly varied, often complex scenes of Dutch life set in a circle with a floral motif in each corner, and tiles with a single hyacinth motif that varied only slightly from hand-painted tile to tile. Their placement, created decorative bands and panels. Little wonder, then, that in 1759, when Mustafa III sought to impress his Egyptian subjects with a reminder that he was their imperial sovereign, he chose to erect a sabil-kuttab of the highest design and craftsmanship. At the time, Dutch tiles were precisely such an impressive commodity; moreover, by choosing a location just across the canal from one of the city’s most famous mosques, in clear sight of countless people, he added that he was not only the temporal ruler as sultan, but also the religious leader as caliph. 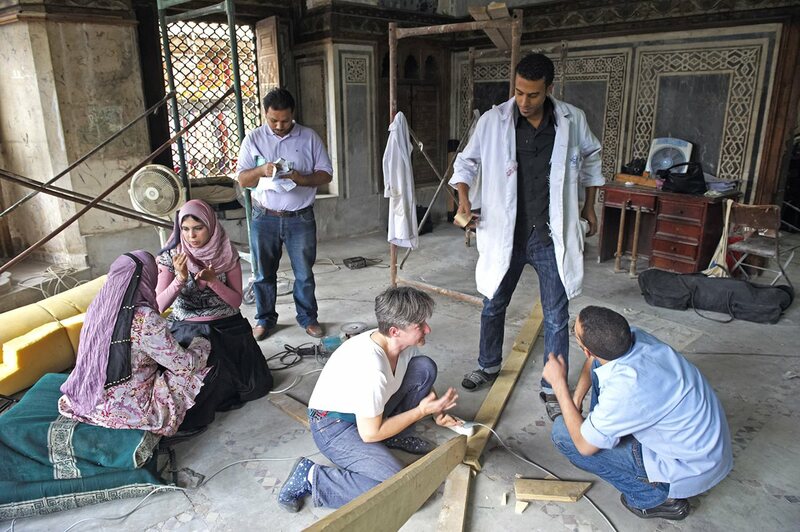 From 2007 to 2009, some 100 conservation and restoration professionals gave new life to the sabil-kuttab, each one bringing his or her skill to marble, wood, tile, plaster and structure. Approaching Sultan Mustafa III’s sabil-kuttab as the conservation work progressed, we would walk along Port Sa‘id Street packed with Korean cars and past shops and stalls selling Chinese toys, Bangladeshi-made clothing, Italian jewelry, Danish cheeses, canned ﬁsh from Thailand and apples from Washington state. Entering the building, we would often ask ourselves, how much things have really changed in this ever-cosmopolitan city if 250 years ago an Ottoman ruler in Istanbul decided to decorate a building in Cairo not only with Turkish motifs carved in marble from Marmara, but also with wall tiles bought in Austria and produced in the Netherlands using a technique that originated in Iraq? Around year 800, the Caliph Harun al-Rashid received a large gift of luxurious Chinese pottery that included early examples of porcelain. Seeking to imitate such vessels in the palaces of the Abbasid rulers, Iraqi potters of the ninth century re-invented the art of tin glazing that had flourished in the same lands in ancient Mesopotamia. Tin-glazed pottery quickly spread from Iraq to Iran and Egypt, and from there across North Africa and into Islamic Spain. (Lusterware, with its shining, golden-hued pat-terns, developed as a spectacular variant.) Tin-glazed pottery became known in medieval Italy, where, under the name maiolica, it became an important medium for Renaissance art. Italian craftsmen established the craft in Antwerp, but after the Spanish sacked the city in 1576, many of them moved to Holland. There, business grew as the Dutch East India Company import-ed blue-on-white Ming porcelain from China that, though popular among the wealthy, remained a luxury out of reach for many in the growing mercantile class. Europe did not perfect this process until the 1710s. In the meantime, there was great demand for cheaper, locally made, tin-glazed products that resembled the blue-patterned Chinese wares. Often generically called “Delft porcelain,” these wares were neither true porcelain, which is underglaze-decorated, nor were they made only in Delft: There were many centers, and Delft was just the most famous. The output of the workshops was prodigious, and wall tiles accounted for a major share of it. These were exported far and wide, even to India, Southeast Asia and the North American colonies. Each of the millions of wall tiles produced over 200 years was hand-painted. This required much skill and a sure hand, because the pigments were applied on a wet surface of tin glaze. No erasures were possible. For speed and efficiency, the out-lines were transferred onto the tile using a stencil made from a sheet of paper with a drawing whose con-tours were pierced with lines of pin-holes. When a sponge or a pouch with powdered charcoal was gently pressed against it, charcoal marks were left on the tile, and decorators could use these lines as guides for their fine brushes. Thus while many pictures were produced from a single stencil, each one differs in details within the same overall composition. Such small differences bear witness to how the decorators brought imagination and creativity to early mass production—results that remain visible today on the walls of Sultan Mustafa III’s sabil-kuttab. Conservation architects Agnieszka Do-browolska and Jarosław Dobrowolski are partners in the Cairo-based practice ARCHiNOS Architecture (www.archinos. com). 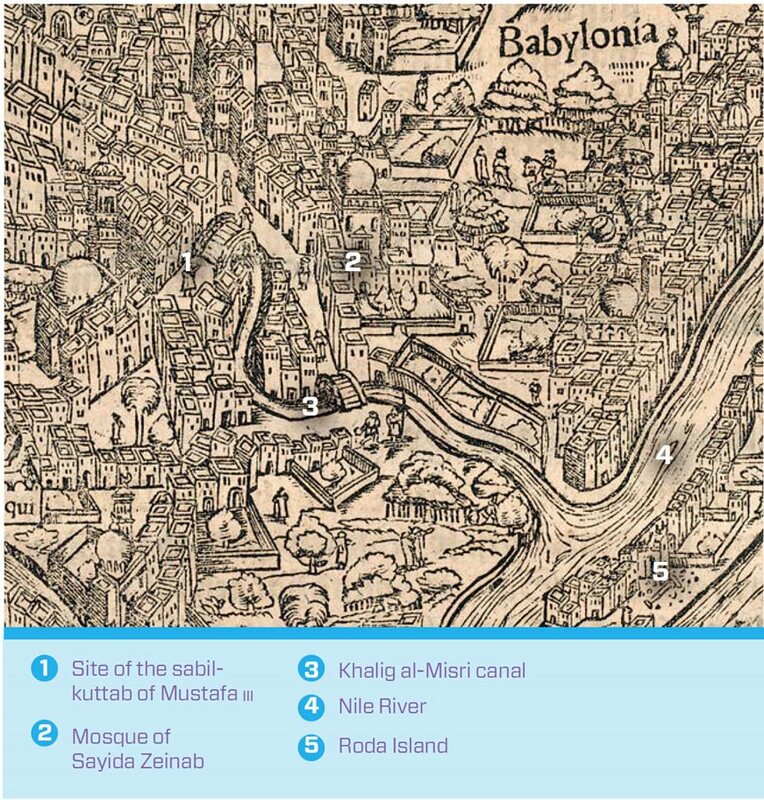 In 2008-9 Agnieszka directed conservation of the sabil-kuttab of Mustafa III with funding from the Dutch Embassy and the Netherlands-Flemish Institute in Cairo (NVIC). She is also co-author of Muhammad ‘Ali Pasha and His Sabil (2004, AUC Press) and author of The Building Crafts of Cairo (2005, AUC Press); Jarosław is author of The Living Stones of Cairo (2001, AUC Press) and they jointly authored Heliopolis: Rebirth of the City of the Sun (2006, AUC Press). 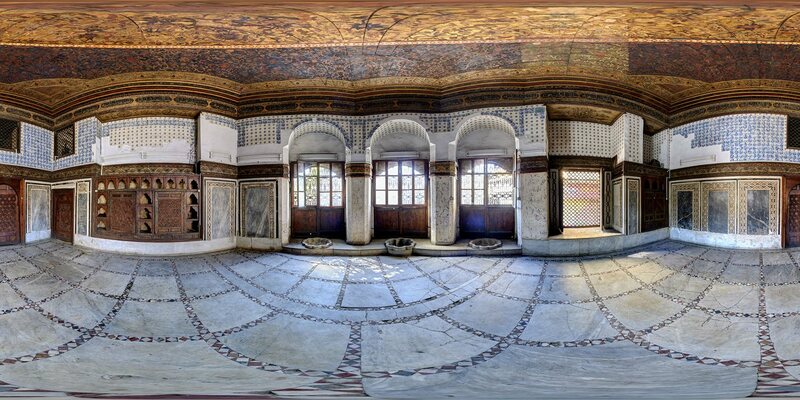 Matjaž Kačičnik documents cultural preservation using traditional and 360-degree panoramic images. His photos appear courtesy of the Netherlands-Flemish Institute in Cairo (nvic).